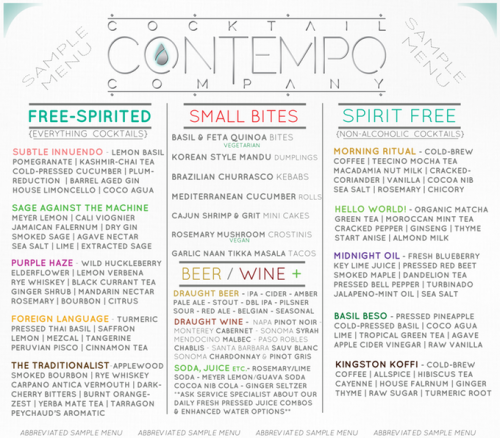 The brainchild of veteran bartender Jonny Cimone, Contempo Cocktail is delivering something new to the cocktail scene at large — artisan drinks without the artisan wait and with an eco-conscious venue to serve them in and deliver them from! Crafted by hand in a kitchen that Cimone is hoping to trade in for a modern storefront, coffee house, juice bar, and lounge through his Kickstarter campaign, Contempo cocktails are made each day with locally sourced produce, gourmet components from around the globe, and juices and brews made in-house. The cocktails are bottled up and delivered to customers throughout the Bay Area, including restaurants and businesses. 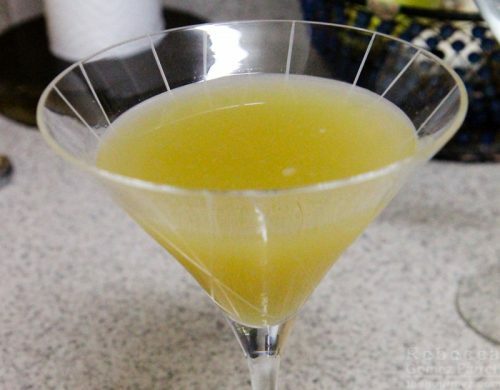 Keep those cocktails refrigerated, shake them up and consume within a week, and you have a multilayered libation with the convenience of a mini-fridge. They come in Free-Spirited (spiked) and Spirit Free (virgin) forms, and each has an average of eight well-considered ingredients. Many of those are tinctures, shrubs, or brewed tea and coffee that require plenty of steps before they come to full fruition themselves. Imagine the seconds of your lives saved while waiting for that perfect drink! Here’s a sample of what may appear at the lounge. There are only 13 days left for the Kickstarter campaign with $20,000 to raise, so head on over to help Cimone’s zero-waste, 100% efficiency model of merry-making come to life. Prizes range from secret handshakes to a Contempo-catered office party to, of course, the bottled cocktails themselves. You didn’t think I wrote this without trying the drinks, did you? Silly reader! Each bottle is 10 ounces, so you get a good 1.5 to 2 cocktails. A friend sampled them with me, and our only real critique was that we could hardly taste the alcohol in the mix. Keep in mind that we both often order a stiff Sazerac, so we’re used to a strong alcohol presence. The Contempo cocktails we tried are more geared toward consumers with a fruitier tooth — and that’s sometimes me, too. At 10% ABV, they have a higher alcohol content than most beers but lower than most wines, which is nothing to scoff at. And as my body informed me later, when the effects crept up on me, the alcohol is definitely in there! There is also a ton of flavor and many, many layers. We went for the lighter colored cocktail first, through some misguided notion that cocktails should be sampled in the same order as wines. 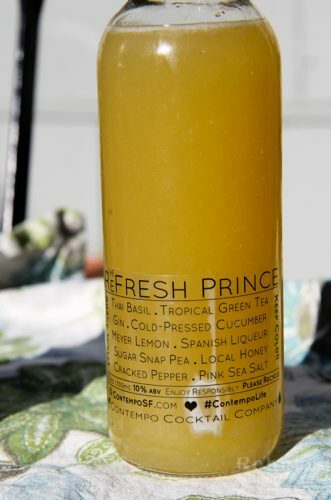 The ReFresh Prince, wittily named, contains Thai basil, tropical green tea, gin, cold-pressed cucumber, Meyer lemon, a Spanish liqueur, sugar snap peas, local honey, cracked pepper, and pink sea salt. What a grocery list of garden goodness! 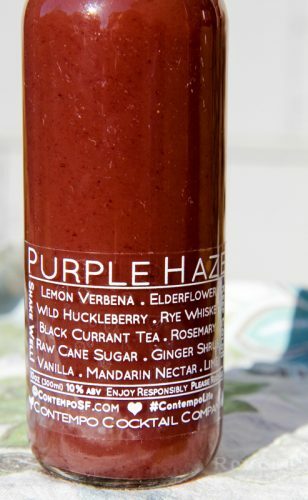 The Purple Haze is made with lemon verbena, elderflower, wild huckleberry, rye whiskey, black currant tea, rosemary, raw cane sugar, ginger shrub, vanilla, mandarin nectar, and lime. Sage comes to mind when sniffing, though rosemary and lemon verbena are the primary herbs. 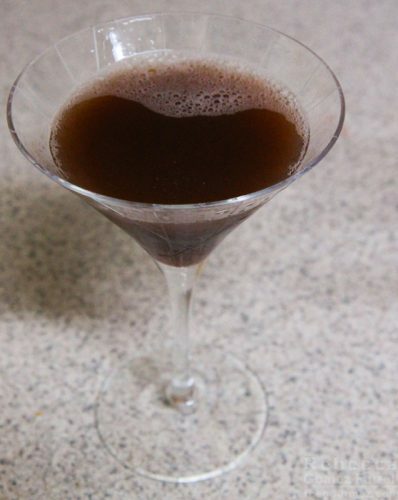 The vinegar shrub smells nice and makes itself known by elevating the huckleberry’s dark berry abyss. The lime is near impossible to pick out but beautifully used in that it imparts a pithy bitterness that the tea leaves happily support. Love the foggy — dare I say hazy? — depths of this drink. 4/5 as is, but if I could taste that rye whiskey, it’d earn top marks. So…I’m sold! 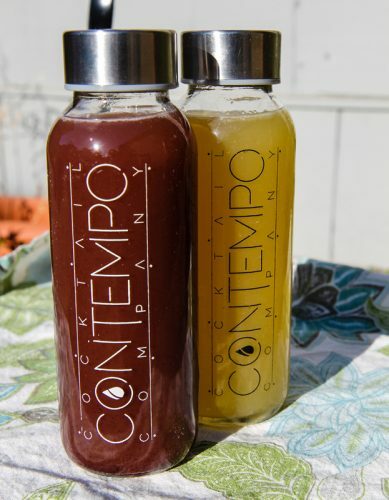 Contempo Cocktails captures all the sophistication of a fancy drink made in the heat of a loud, bustling hot spot without the hassle of waiting for the bartender to notice you over the heads of other thirsty patrons. It’s definitely worth a Kickstarter pledge, and I look forward to trying more in the lounge someday! Here’s that Kickstarter page (link again), and yes, obligatory disclaimer, I received those two bottles as free samples to review on the blog. Wow – what a great idea! I would love something like this in Toronto, especially if it allows for healthier cocktail options.